Socioecological models provide a framework for predicting how animals respond competitively to the abundance and distribution of food resources. Testing predictions of socioecological models requires analysis of relationships among food resource characteristics, competitive behaviors, and measures of rank-related skew in energy balance or reproductive success. A positive relationship between dominance rank and energy balance has been observed among female mountain gorillas in Bwindi Impenetrable National Park, Uganda. This study examines the proximate mechanisms underlying feeding competition among those females. To assess the contestability of food resources, we measured the time a female spent feeding at a food site (food site residence time). We also examined the relationship between dominance rank and the access to resources, as well as the rate, context, and direction of aggression, and the number of neighbors in close proximity. As predicted, females had longer food site residence times and higher aggression rates with fruit and decaying wood than with herbaceous vegetation, suggesting that those resources may be contestable. Aggression was predominantly directed down the dominance hierarchy, although against expectation, rank was not significantly correlated with aggression rates or the time spent feeding on contestable foods. Higher-ranking females had significantly fewer neighbors, suggesting that lower-ranking females avoid higher-ranking ones. 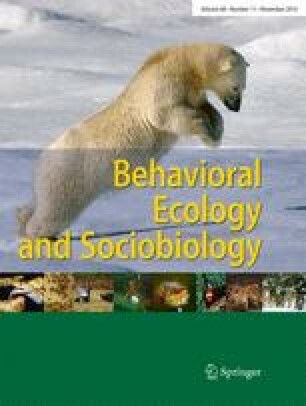 This study provides additional support for the claim that there is variability in how primates respond to the quality and distribution of food resources and that avoidance as a strategy to cope with feeding competition may result in similar skew in energy balance as rank-related aggression. The online version of this article (doi: 10.1007/s00265-014-1788-6) contains supplementary material, which is available to authorized users. We thank the Uganda Wildlife Authority and the Ugandan National Council for Science and Technology for permission to work in Bwindi Impenetrable National Park. We are grateful to the Institute of Tropical Forest Conservation for logistical support. A special thanks goes to all members of the gorilla research team, including Dennis Musinguzi, Beda Turyananuka, Tibenda Emmanuel, Caleb Ngamganeza, Gervasio Byaruhanga, and Edson Nzabarinda. We are extremely grateful to Roger Mundry, Colleen Stephens, and Andrew M. Robbins for statistical support. We thank Christophe Boesch and particularly Andrew M. Robbins for helpful discussion and constructive criticism on earlier versions of this manuscript. This project was funded by the Max Planck Society. This study complied with all Uganda Wildlife Authority regulations.